Staying connected in the wild is important to staying safe and getting help packing out an animal when you need it. The Motorola Walkabout T605 two-way radio has a fully waterproof design and a range of up to 35 miles in the mountains. These walkie talkies have tons of great features including the fact that if you drop them in water, they float and light up so you can easily find them. There are no better radios for outdoor activities in a wet or wild environment. No matter where you are, these two-way radios are perfect communication devices. They can handle severe rain and even on the water can handle up to two miles of contact. The radios can withstand a submersion of up to 30 meters at three feet deep. If the radios do fall in water, they will float face up. Not only are these radios built to handle any type of weather, but they’ll also alert you if there is bad weather coming. They feature 11 weather channels with alerts so that you know what’s coming. There is also an alert siren that you can activate that will help send a signal in case you are in danger. Hunters have problems with radios due to the fact that people may send them a message when an animal is there, scaring the animal away. These radios will not cause that issue since they have a VibraCall feature that shuts off ringing so that you know before you answer. Batteries in the Motorola Talkabout T605 H2O radios last 9 hours and are rechargeable. You can also add in two double AA batteries to each radio and they will last 23 hours. 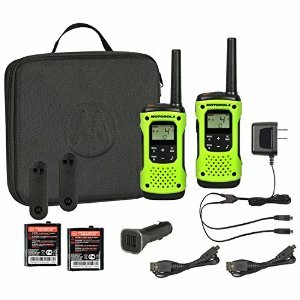 Purchase your own Motorola Talkabout T05 H2o two-way radios here for $119. You will not regret these long-lasting and insanely durable walkie talkies.